Cloudy skies this morning will become partly cloudy this afternoon. High 54F. Winds NNW at 15 to 25 mph..
Clear to partly cloudy. Low 44F. Winds N at 10 to 20 mph. President Harry Truman presented Desmond Doss with the Congressional Medal of Honor. 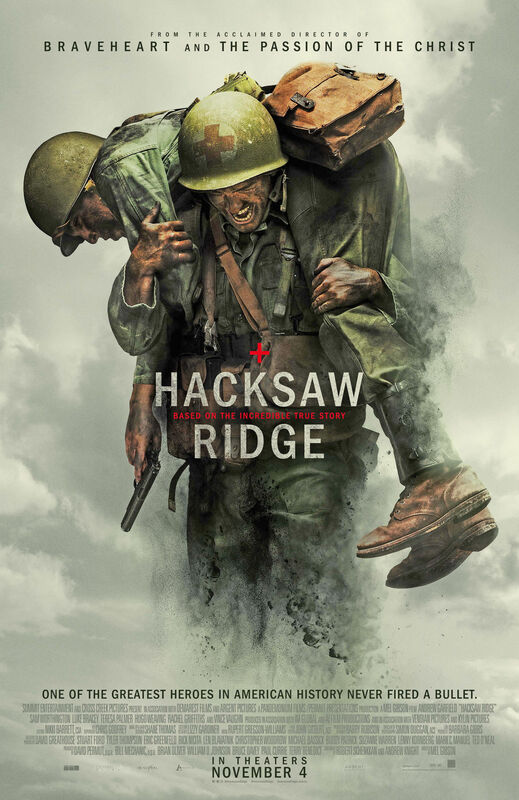 Doss was the father of Long Beach Peninsula resident Desmond Doss Jr.
A movie poster for “Hacksaw Ridge,” by Mel Gibson, featured Desmond Doss Sr.
Desmond Doss, Jr. spoke in 2011 of how the war was never over for his father, Desmond Doss, Sr. He was awarded the Congressional Medal of Honor during World War II "while never touching a weapon" and then Doss, Sr. spoke at countless functions and "was in every parade." Desmond Thomas Doss was a U.S. Army corporal who served as a combat medic with an infantry company during the Second World War [1, 2]. Doss was twice awarded the Bronze Star Medal for his service in Guam and Philippines in 1944. He further distinguished himself in the Battle of Okinawa by saving the lives of at least 75 wounded infantrymen, becoming the only conscientious objector to receive the Congressional Medal of Honor for his actions during World War II. During the war, while others were taking lives, Doss was busy saving lives. When the cry “medic” rang out on the battlefield, he never considered his own safety. He repeatedly ran into the heat of battle to treat a fallen comrade and carry him back to safety. All this took place while enemy bullets whizzed past him and mortar shells exploded around him. Doss was seriously wounded four times in Okinawa and was evacuated on May 21, 1945, aboard the USS Mercy. He suffered a left arm fracture from a sniper’s bullet and at one point had seventeen pieces of shrapnel embedded in his body. Before being discharged from the U.S. Army in 1946, Doss developed tuberculosis. He would spend most of the next six years in hospitals. Cold, wet, sleepless nights, shivering in a muddy foxhole on the islands of the Pacific had taken their toll. As his illness progressed, his left lung had to be surgically removed along with five ribs. He survived the rest of his life on a single lung until that too failed. Doss died at the age of 87 on March 23, 2006 in Piedmont, Alabama, after being hospitalized with difficulty breathing. Doss’ life has been the subject of books, the documentary "The Conscientious Objector," and the 2016 movie "Hacksaw Ridge." 1. If numbers 1 to 26 are assigned to the letters of the English alphabet, the sum of the numbers assigned to the letters of Desmond Thomas Doss equals 207, that is, Doss’ birth date, February 7 (2/07). 2. Furthermore, the prime factors of 207, namely 3 and 23, put side by side gives 323, that is the day Doss died (3/23) in 2006. 3. Moreover, Doss died at age 87 and if 87 is split into its digits 8 and 7, the 8th and 7th prime numbers are 19 and 17 and the product of 19 and 17 also yields 323. 4. If Doss’ birthday expressed as 2/07/1919 is split into 207, 19 and 19, 19 plus 19 equals 38 and the 38th day of each year is 207, that is, February 7. 5. Doss’ birthday 2/07 coincides with the 38th day of each year, the day he died 3/23 coincides with the 83rd day of each leap year, and note that 83 is the reverse of 38. 6. Doss’ birth year 1919 equals 19 times 101 and these two prime numbers differ by 82. Interestingly, Doss died on the 82nd day of 2006. 7. Further, the prime factors of Doss’ birthday expressed as 02071919, namely 1399 and 1481, differ by 82 too. 8. Doss died in 2006 at age 87. The reverse of the sum of the prime factors of 2006, namely 2, 17, and 59, equals 87 too. 9. If 03/23/2006, the day Doss died, is split as 03, 23, 20, and 06, 03 plus 23 equals 20 plus 06. 10. The numbers assigned to the letters of Doss put side by side yields 4151919. If 4151919 is split as 415 and 1919, 415 minus one equals twice 207 (Doss’ birth date, February 7) and 1919 is Doss’ birth year. Additionally, if 1919 is split as 19 and 19, 19 plus 19 is 38 and the reverse of 38, namely 83, times the difference of its digits, namely the difference of 3 and 8, equals 415. 11. If Doss’ centennial birthday expressed as 02/07/2019 is split as 0207 and 2019, the sum of the prime factors of 0207, namely 3 and 23, equals 26 and the sum of the prime factors of 2019, namely 3 and 673, equals 26 square. Additionally, 3 and 673 are the 2nd and 122nd prime numbers and interestingly, 2 and 122 add up to 124, 124 is twice 62 and 62 is the reverse of 26. 12. Lastly, if Doss’ centennial birthday expressed as 2/7/19 or simply as 2719 is split into two numbers each consisting of the alternating digits of 2719 as 21 and 79, these two numbers add up to 100, signifying Doss’ 100th birthday. Happy 100th birthday to American hero, Desmond Doss! Aziz Inan is chair and professor teaching in the electrical engineering program of the Donald P. Shiley School of Engineering at University of Portland. He can be reached at ainan@up.edu.